The MinKwon Center for Community Action is a community-based organization founded in 1984. In 2009, as it entered its 25th year, the Young Korean American Service and Education Center (YKASEC) was renamed the MinKwon Center for Community Action. The MinKwon Center focuses on the promotion of civil rights, civic participation, community organizing and advocacy, social services, culture, and youth empowerment. In the wake of the civil rights movement and major reforms in immigration law in 1965, American society underwent drastic changes. While the Korean community in the U.S. grew rapidly, Korean Americans lacked a sense of unity as a community. Many were first-generation immigrants who suffered racial discrimination and experienced language barriers. In this context, the founding members of the MinKwon Center established an organization that emphasized meeting the needs of marginalized community members with less access to resources. During its early days, the MinKwon Center focused its efforts on social and political education for young Korean Americans, as well as social services for the general community and the elderly. Our educational efforts – preschool care for working parents, afterschool activities and classes for elementary school children, and a summer youth program – were well-received by the community. The founding members built a free open library consisting of 3,000 books on civil rights and social issues. The members also created a monthly educational class geared towards Korean Americans to cover important political issues of the day. The MinKwon Center also began to expand the scope of its social services for immigrant communities, especially for the elderly, and low-income immigrants who spoke limited English. The staff set their hearts and minds on providing critically-needed services, such as applying for government benefits, registering for senior housing, obtaining citizenship, and resolving debt. Through these efforts, the MinKwon Center began to establish itself as an important Korean American community-based organization. The MinKwon Center also started the first pro bono legal clinic for the Korean community with the Asian American Legal Defense and Education Fund (AALDEF). This clinic – which provided free legal consultations and assistance on immigration law, racial discrimination and violence, and small business assistance – was a crucial first step towards providing accessible legal support for low-income Korean immigrants who otherwise would not be able to afford such services. 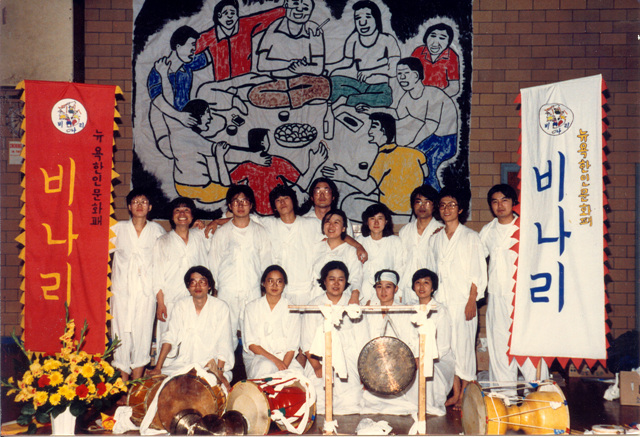 In 1985, the MinKwon Center created a Korean American cultural troupe, Binari, that played a singular role in educating and revitalizing Korean cultural traditions. One Binari performance at the Flushing Corona-Meadows Park brought together 2,500 people from as far as Boston, Philadelphia, and Rhode Island. Through Binari, the MinKwon Center played an active role in reviving interest in and awareness of Korean “grassroots” cultural traditions. Binari performed at cultural events and through doing so, combated the cultural isolation and loss of cultural roots in the Korean American community by spreading Korean traditional culture to the mainstream. In order for a small minority group like the Korean American community to become more empowered, it was essential, in the first place, to build a united movement of multi-racial, multi-ethnic minority communities. Since its inception, the MinKwon Center understood this reality and embraced an inclusive philosophy and placed emphasis on meeting the needs of all community members with less access to resources. We advocated for the rights of all immigrants, and participated in protests and rallies against racial discrimination and police brutality. These efforts went beyond serving the Korean American community and towards reaching the broader immigrant and minority communities. The 1992 Los Angeles Riots was a turning point for the Korean American community. The Korean American community came to the stark realization that it could not escape the deep-rooted social, racial, and economic problems that plagued the rest of the country. Soon thereafter, as anti-immigrant politicians swept into power after the 1994 elections, reactionary politicians within Congress began to blame immigrants for social ills. These politicians pushed for harsh, discriminatory, anti-immigrant policies symbolized by California’s Proposition 187. Public benefits for both undocumented and legal immigrants were sharply cut back, deportation was emphasized, and similar laws cropped up across the country. This anti-immigrant wave swept across the U.S. and began to seriously threaten all immigrant communities. At this historical moment, the MinKwon Center actively began its efforts to engage in full-scale advocacy on behalf of immigrant rights. MinKwon worked to counter the arguments of anti-immigrant advocates, and launched an initiative to promote the contributions of immigrants to society. Anti-immigrant politicians argued that immigrants were taking up too many social and governmental resources. However, this argument was unfounded -- for every dollar in benefits that immigrants received, they paid even an even greater share in taxes. Immigrants helped America’s economy grow and brought valuable cultural contributions as well. MinKwon Center’s educational efforts gave rise to a series of publications, booklets, and articles dispelling anti-immigration arguments and raising awareness of the valuable roles of immigrants in the U.S.
Washington Post Ad Campaign: This was a signature campaign to place two full-page advertisements in The Washington Post, a newspaper of choice for U.S. policymakers. The MinKwon Center planned to bring together communities to post the advertisement highlighting immigrants’ contributions to American society, and the destructive nature of anti-immigration policies. MinKwon Center’s volunteers and staff worked for two months on efforts such as the “One Person, One Dollar” fundraising drive, bringing together more than 300 organizations from various communities to raise money for the advertisements in the Post. Paper Plate Campaign: When anti-immigrant politicians in Congress began to slash social benefits such as food stamps – a critical means of support for low-income and elderly immigrants – the MinKwon Center launched a successful campaign to gather signatures and stories on paper plates from affected communities. Hundreds of these paper plates were sent to politicians in Congress and policy-makers. Fix ‘96 Campaign: In 1996, Congress passed an immigration law that made it more difficult for legal immigrants to reunite with their families who lived abroad. The new policies emphasized expelling undocumented immigrants, and established a 3- or 10-year bar on allowing them re-entry into the country. The MinKwon Center started the Fix ’96 campaign with other civil rights and legal organizations to roll back and amend these laws. The surge in anti-immigrant hostility that began in the 1990s made immigrants’ lives more difficult. Yet, it was also an opportunity for the community to organize and advocate for political and social empowerment. 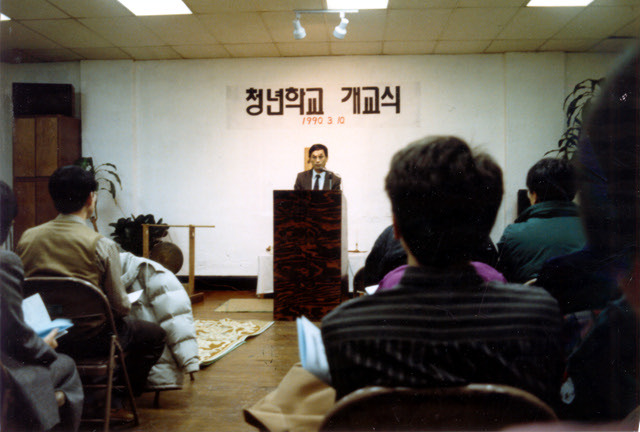 The Korean American community’s activities served as a model for immigrant rights advocacy, and the resulting campaigns spearheaded by the MinKwon Center stand as a proud achievement. Our participation in a White House ceremony with President Clinton to roll back the cuts in social benefits for immigrants remains a powerful and poignant memory to this day. Throughout the 1990s, the MinKwon Center led efforts to engage Korean Americans to participate civically through our expanding advocacy, education, social services, and cultural programs. Through our immigrant rights advocacy and civic participation, the MinKwon Center established itself as a leading civil rights organization. The new century was marked by one of the greatest tragedies in U.S. history - the September 11 attacks in 2001. The events brought forth drastic change in the direction of American foreign and domestic policy with heavy emphasis on "national security." Not only were the civil and human rights of immigrant communities violated, but also the rights of the general American public were at stake. This had a negative impact on the advancement of immigrants’ rights work of the 1990s, and efforts to bring issues like immigration reform to the table were halted. The vision of building a united multiracial society became clouded, and conflicts among different communities intensified. Against this social and political backdrop, the MinKwon Center for Community Action continued to work for immigrants’ rights, but also expanded our efforts to reach outside of the immigrant community. We expanded our advocacy efforts to fight budget cuts on the city, state, and federal levels, focused on bringing about improvements in the education system to support immigrant students, and concentrated on reforming America's currently broken immigration system. * Campaign for Comprehensive Immigration Reform: The current U.S. immigration system is broken. More than 12 million immigrants are undocumented, immigration backlogs are decades-long, and the system admits only a fraction of the number of foreign workers needed in the workforce. Together with other community organizations, the MinKwon Center made every effort to justly and properly reform our immigration system. Through our recent New York Times ad campaign, Sending Immigrants’ Pictures Campaign, and the National Asian Pacific American Lobby Day, the MinKwon Center played a leading role in organizing Korean Americans to participate in this effort with millions of immigrants across America. * DREAM Act Campaign: The MinKwon Center worked continuously to pass the DREAM Act, which would allow immigrant students to gain legal immigration status and to fulfill their dreams in the U.S. Through petition drives, grassroots lobbying efforts, and national conferences, we played a leading role in building a coalition with other students and organizations to pass the DREAM Act. * Equal Access to Drivers Licenses Campaign: In the wake of 9/11, Congress passed the REAL ID Act, which prevented states from allowing undocumented immigrants to register for drivers’ licenses. This was a crisis in New York, as nearly 300,000 people were in danger of losing their drivers’ licenses. The MinKwon Center began an organizing campaign by forming the “New York Coalition for Immigrant Rights to Drivers’ Licenses Coalition” with over 60 other community groups, unions, and organizations. The campaign was initially successful, and Governor Spitzer announced a new policy allowing all New York residents equal access to drivers’ licenses, although he later retracted the policy. * Truth about Immigrants Campaign: In 2008, the MinKwon Center launched a campaign to inform non-immigrant communities about immigrants and their valuable contribution to American society. The MinKwon Center launched the Truth About Immigrants Campaign by partnering with a local organization, the NAACP - Northeast Queens chapter, on an educational and mass media campaign to dispel myths towards immigrants. * African American – Immigrant Community Unity Efforts: Due to social prejudices, relations between the African American and immigrant communities have often been strained. The MinKwon Center played a leading role in working with the New York Immigration Coalition (NYIC)’s “Building Bridges Conference,” which brought communities together to strengthen ties and develop joint responses to public policy issues. * Fighting Against Budget Cuts Campaign: As the 2008 recession deepened, the state and the city governments tried to cut the budgets of basic and essential services for community members during a time when they needed these services the most. To prevent these potentially devastating cuts, the MinKwon Center served as a Steering Committee member of the One New York Coalition, a group of nearly 200 organizations that engaged in large demonstrations and grassroots lobbying at both Albany and City Hall. Because of our coalition’s efforts, the state and the city governments changed their policies and restored a great deal of the threatened funding for these critical services. * Anti-Hate Crime Efforts: In recent years, there have been several vicious hate crimes targeting immigrants in the New York City area. With other communities of color, the MinKwon Center participated actively on efforts to combat these hate crimes that split communities apart. * Korean Immigrant Deportation Defense Efforts: The MinKwon Center undertook a campaign to defend a Korean-American family whose mother faced the threat of deportation. We initiated a postcard campaign targeting U.S. Immigration and Customs Enforcement (ICE), as well as collection to post bail. In response, the Korean American community rallied behind this family by sending a constant stream of donations to the MinKwon Center, and actively participated in the postcard campaign/petition drive. As a result of our collective efforts, this mother was able to leave the detention center and reunite with her family to continue the fight against her deportation. In addition to advocating for immigrant rights and organizing immigrant communities, the MinKwon Center focused much of our efforts on politically empowering our communities. Through our Civic Participation Program – our efforts in voter registration, voter education, research, protection, and mobilization – the MinKwon Center sought to fundamentally strengthen the political power of our community. * Registering 70,000 Immigrant Voters: Since 2004, when the MinKwon Center launched our first New Immigrant Voter Registration Drive, we have registered over 70,000 new immigrant voters. Week in and week out, MinKwon Center’s staff and volunteers engaged in street outreach, special events, and registration drives at the Brooklyn courthouse. This massive registration drive is the cornerstone of our political empowerment activities. At the same time, since 2000, the MinKwon Center expanded the scope and reach of our social and legal services to the community. Each year, the level of social and legal services we provided free of charge for those who are low-income, new immigrants, limited English proficient, elderly, youth, and others vastly increased. Currently, the MinKwon Center’s Social Services Program includes assistance with filing income tax returns, and applications for food stamps and other benefits. Our Immigrant Rights Legal Clinic offers a full range of legal services from basic consultations to full representation on immigration, labor, and housing cases. 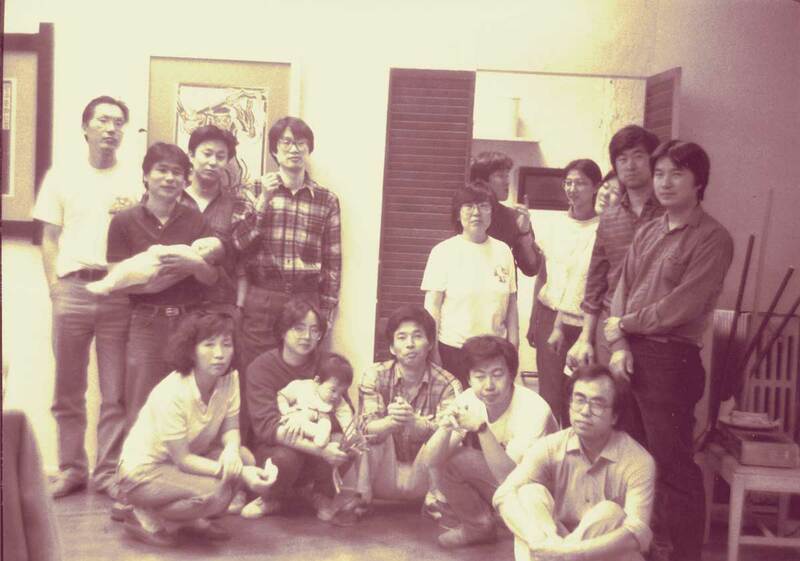 Over the years, the MinKwon Center also deepened and strengthened our community organizing. Participants of community meetings such as young adults, tenants, immigrant youth, and DREAMers have actively participated in defending and promoting our rights and political interests. Since the founding of the MinKwon Center, the organization provided a wide range of educational programs to guide our youth to take part in various group activities and efforts that plant social awareness in the community. The past 30 years of the MinKwon Center’s history is truly a story of our community. In 30 years, the MinKwon Center has grown into a vibrant and active organization because of the sacrifice and dedication of those who have gone before us and the participation and support of the entire community. While the MinKwon Center has roots in the Korean American community, many other communities have played a significant role. As the MinKwon Center moves forward, let us all work together to build a prosperous and just America for all.